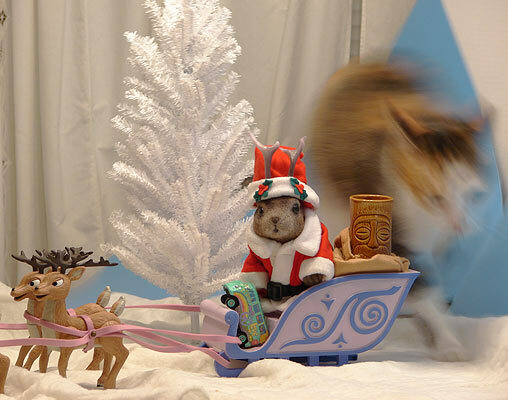 Ace Jackalope wishes you a Merry Christmas. May Santalope bring tiki mugs, sputniks, and other cool things to all good girls and boys who appreciate retro-culture, patronize their local diners and utilize mom-and-pop motels when on the road. Oh, and who are nice to people. Now that's the way to laugh at adversity. 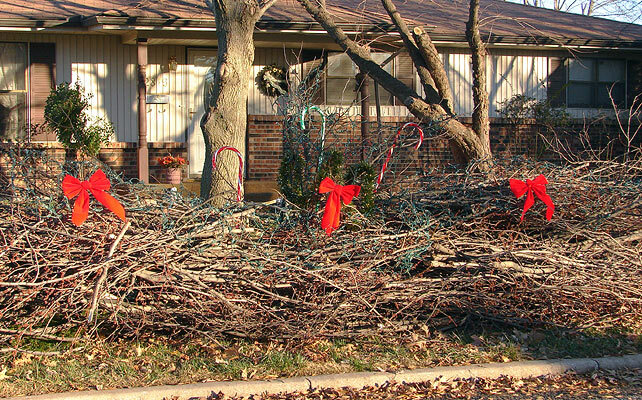 A homeowner on South Delaware Street in Joplin, Missouri has decorated their pile of ice stormed branches. My lovely significant other's present to me was wrapped in this cool googie paper she found. 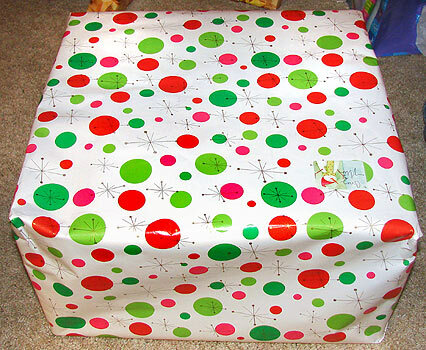 Her family opens presents on Christmas Eve. 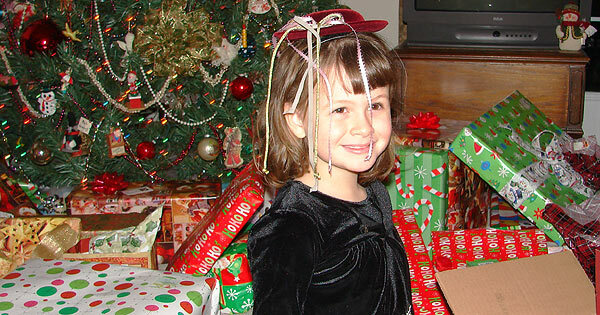 Here, her niece takes a break from shredding wrapping paper long enough to model a doll's hat. After leaving the girlfriend's family, I sought to experience a midnight mass conducted in a decently old church. I'm not sure why - perhaps a quest for diversity? Maybe I wanted to experience the transition to Christmas in the company of hundreds of folks for whom the holiday has a more religious significance than it does for me. 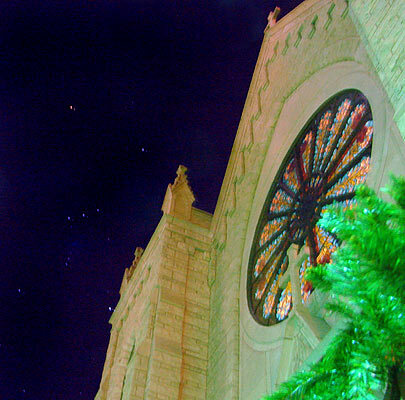 The constellation of Orion the Hunter rises above St. Peter's Church in Joplin, as the clock strikes midnight. 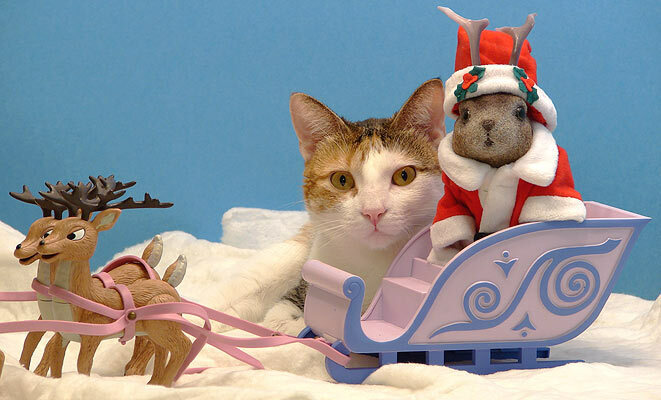 It is now Christmas day. Inside, worshipers engage in ritual. 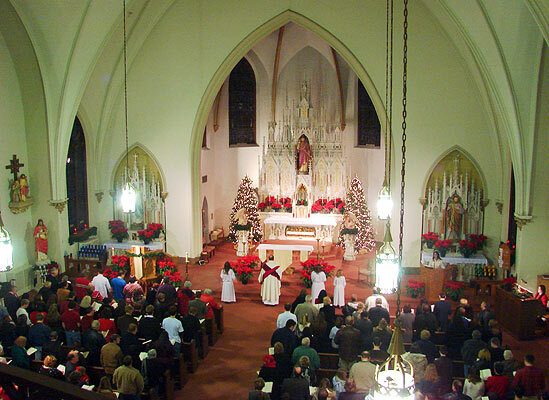 I'm not that familiar with what exactly one is supposed to do in a mass, but show me a group of people gathering at midnight to sing Christmas music in a church with architectural character and I'm darn fond of them. And I love the incense, too. 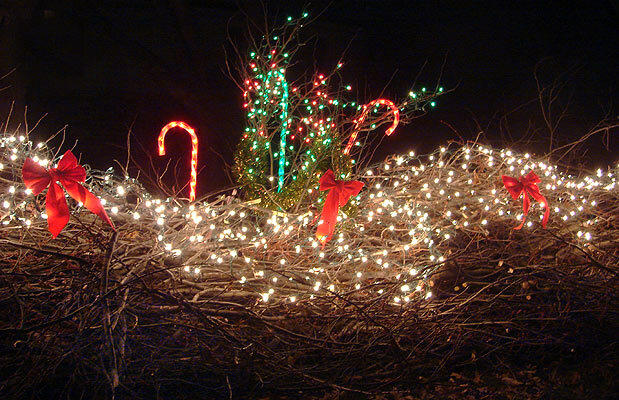 After mass, I stopped back by that decorated pile of limbs. It looks so festive at night. Back at Mom's, Weaselhead the cat joins my brother and I in our own ritualistic late-night watching of Christmas cartoons. The Grinch? No. Frosty? No. 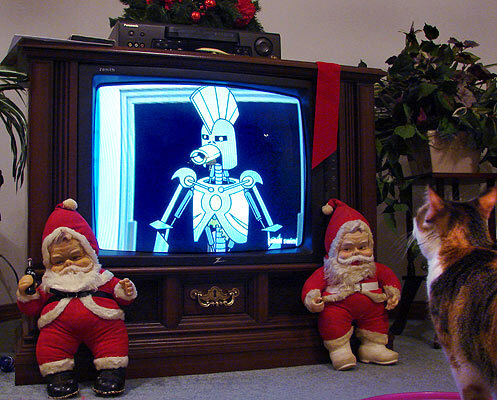 It is our beloved classic, Aqua Teen Hunger Force and the robot from the future as the Ghost of Christmas past. 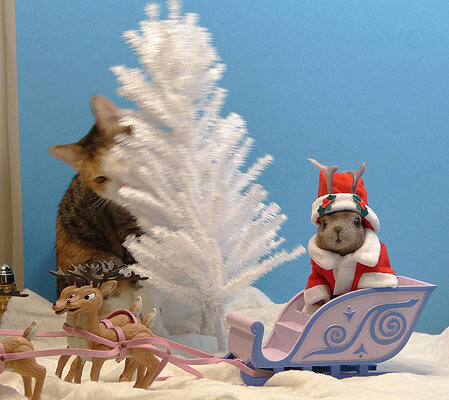 "Thousands of years ago..."
Sometimes you're just minding your own business, trying to photograph a jackalope and some reindeer on a tabletop when someone just barges in and naps on your set. Of course, she had to mark the tree. I really thought she was going to knock it over. Note how Ace ignores her. Finally, Weaselhead strikes a nice pose. I had added a Kon Tiki shot glass and a "Cars" Filmore the van autographed by artist Bob Waldmire to represent tiki and Route 66, two of the interests that enriched my year. I inserted the sputnik ornament in post-production to represent googie; had it really been there, the cat would have been knocking it around. Bored with posing, Weaselhead exits the stage, knocking over the backdrop in the process. Note the professionalism of Ace, in that he holds his pose and doesn't even look at the commotion over his shoulder. Neither distressed nor apologetic for striking the set prematurely, she uses the backdrop pieces as a ramp. Oh! And Merry Sputmas, too. 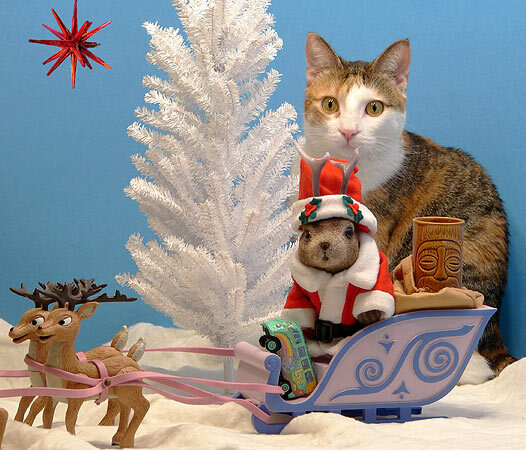 Happy holidays to you, Ace (and to Greg and all lope-lovers everywhere). 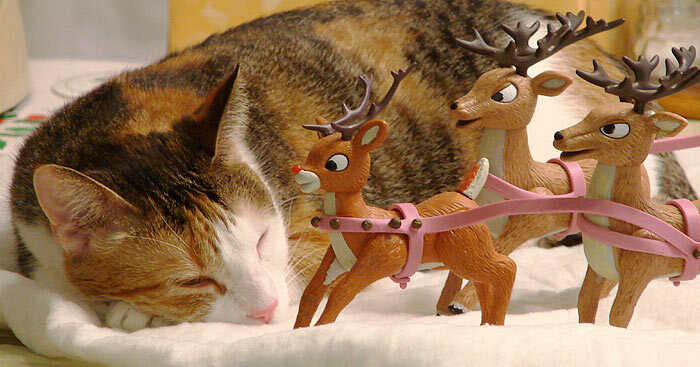 Some of those reindeer look positively vicious! Bubby; I wouldn't say they're vicious, but they have been known to be exclusionary and cliquish (or so says Rudolph's publicist). 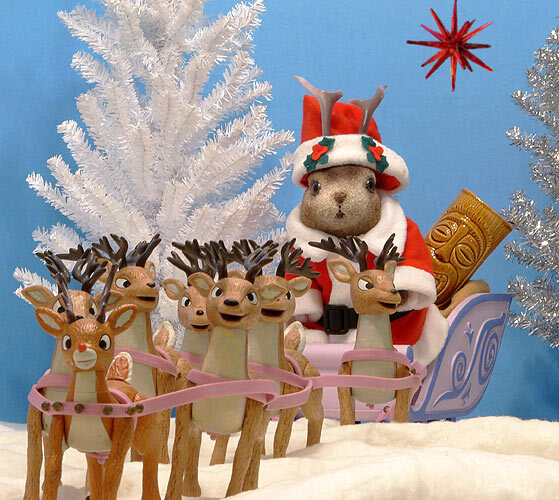 Actually that Rudolf playset is one of my best Boxing Day finds. I think it was $60 at Toys R Us (full price) and for some odd reason, $2.29 on Dec 26, which is obviously waaaay below half price. I was very happy.